Well, at least that particular fan girl I mentioned has guessed correctly via private channel. And then I also realized that maybe those who have guessed wrongly haven’t watched the TV series that made that guy so well known these days. So, time to give another shot at another famous figure. This one is also suggested by The Girl Who Loves Peter Pan and she said he would be easier to recognize. He’s also well known for his portrayal of a prominent character in the same TV series to who sixth day model is famous for. And he’s definitely more famous, being already well known even before he participated in the series. Robert De Niro, Viggo Mortensen, Jean Reno, Christian Bale, they all have worked with this guy. So I really hope this time this works, and at least some of you can recognize him here. As usual, I used that cheap nylon-hair Reeves brush and cheap Yamura ink, and drew directly without any sketch. Had a hard time keeping up the mood, and that’s because I’ve underestimated his fur cloak. Much more difficult than I thought it would be. Took me nearly 20 minutes to draw this one. ~ by edwinlives4ever on October 7, 2014. The model played a prominent character in the first part of the trilogy. I think that “brace yourself” should’ve been a clear enough clue. Wrong. Not far but still wrong. Now you go even further from the answer. Concentrate on the person, not the character. Sean Bean. Game of Thrones. Ini buyutnya Iron Man. 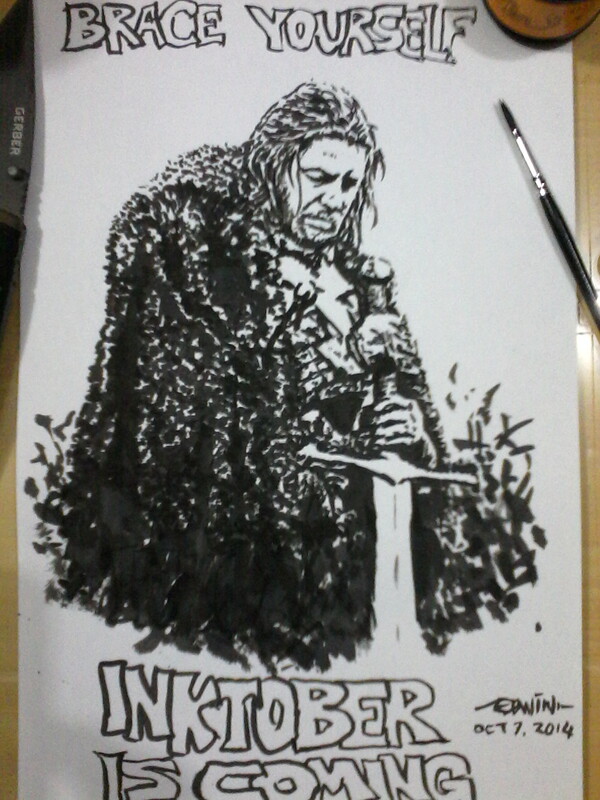 Eddard “Ned” Stark.